For many of the Australian Convicts players who toured South Africa in February, the clinics for kids was one of the highlights. Although the matches were fun, and the sightseeing impressive, the personal contact made in less-visited places was something special. After the tour many of the players also went on to visit other places in southern Africa, such as Cape Town, Victoria Falls (Zimbabwe and Zambia) and Chobe National Park in Botswana. Here we talk about the clinics, and note that the previous stories on the matches have been updated with photos. 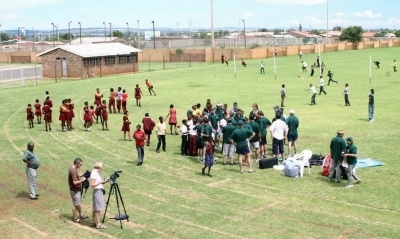 Although the players that signed up for the Convicts tour were expecting some games of footy and some sightseeing, they also got a unique opportunity to do clinics for children in some of the townships. Having 200 excited kids unleashed on the team at the first clinic, outside of Potchefstroom, was a little intimidating at first, but soon the guys got the drills organised. The children seemed to have great fun, and there was no doubt the players did too. Fortunately AFL South Africa had dozens of footballs to keep the drills moving quickly. Australian television (the ABC) even made an appearance (pictured below), which should have helped promote South African footy back in Oz. The second clinic was held on a very got day in Itsoseng, a remote area of North West Province. The final session was in Ramatlabama, a border town (with Botswana), also in North West, not far from Mafikeng. The kids were never camera shy, as we found again in Itsoseng, for the second clinic, in a remote area of North West Province. Our welcome was never greater than in Ramatlabama, a border post with Botswana. Not far from Mafikeng, again in North West Province, it is a barren place where people were forced during the apatheid era. The community field had little grass, but the red earth was reminiscent of Outback Australia. The people embraced the players, figuratively and literally, and we stayed on to play a friendly scratch match against the older players. All these experiences were certainly ones that a "normal" tourist would get to have. Unfortunately a near riot broke out when some small gifts (souvenirs from Australia) were handed out. Hopefully our visit brought a little joy to the town. To continue to grow in South Africa, Aussie Rules will have to move into the larger, mainstream communities, but let's hope there is always time for these more remote places.